Add beauty and value to your home with our custom made Butcher Block Countertops. 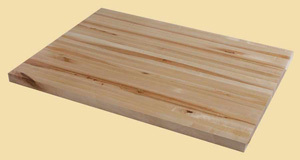 Our Butcher Block Countertops are quality made with sturdy construction to your specifications. 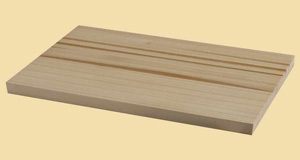 They are offered in edge grain or end grain with any thickness up to 4-1/2" and in almost any width and length. 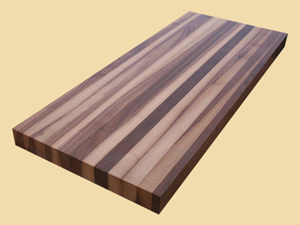 We offer our Butcher Block Countertops in several different wood species, in standard and custom sizes. 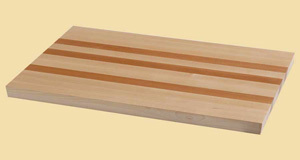 American Cherry Butcher Block: The reddish-brown heartwood gives American Cherry its signature warm, inner glow. The block may also contain, some lighter cream colored sapwood. This hardwood is treasured for its rich coloring, one that deepens with time and use. A sleek, elegant choice for a butcher block countertop. Available up to 4-1/2" thick, 15 feet long, and 84" wide. Ash Butcher Block: Ash hardwood adds light to any space with its light, yellow and brown heartwood, and nearly white sapwood. This blond wood is perfect for a butcher block countertop - it blends effortlessly with any color scheme and brightens kitchens with a little natural light. Available up to 4-1/2" thick, 15 feet long, and 84" wide. 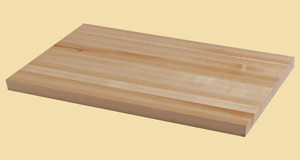 Beech Butcher Block: Beech is an exceptionally hard, heavy, strong natural wood that holds up very well in heavy use applications such as butcher block countertops. 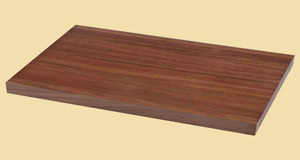 Its heartwood ranges from a light to medium brown, and its white sapwood has a light reddish tinge to it. Available up to 4-1/2" thick, 118" long, and 84" wide. 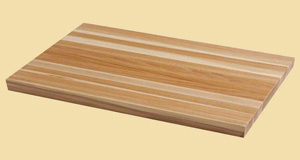 Birch Butcher Block: Recognizable by its yellow tints, Birch features a gentle swirled grain marked by waves or spots that create a fluid surface. Birch can also have a reddish tint towards its heartwood. Over time, it takes on slightly deeper yellow or brown tones, but maintains its overall light color. Available up to 4-1/2" thick, 138" long, and 84" wide. Brazilian Cherry Butcher Block: The beauty and luster of a Brazilian Cherry butcher block countertop deepens with age, making it an heirloom quality piece. Our Brazilian Cherry hardwood offers a heartwood of rich golden brown to a deep reddish brown, with a well-blended light reddish brown sapwood. 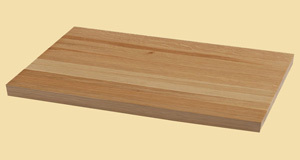 The strength and durability of this wood makes it an excellent choice for a butcher block application. Available up to 4-1/2" thick, 15 feet long, and 84" wide. Hickory Butcher Block: The hardest, heaviest, strongest hardwood found in North America, Hickory is an impeccable selection for a butcher block countertop. It is not only highly durable, but a joy to look at as well - the creamy white sapwood against the medium brown heartwood gives it a warm, lustrous appearance. Available up to 4-1/2" thick, 15 feet long, and 84" wide. Knotty Alder Butcher Block: Knotty Alder is known for the open and closed knots found throughout the wood, giving it its uniquely charming character - every piece is a complete one-of-a-kind. 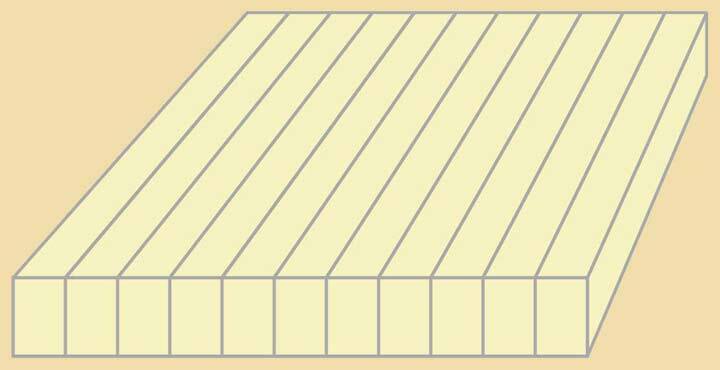 The knots may be large or small, and some may go all the way through the wood. The pale sapwood and light brown heartwood have a faint reddish tinge, which will add to the cozy, sophisticated, rustic look of your butcher block countertop. Available up to 4-1/2" thick, 115" long, and 84" wide. Knotty Pine Butcher Block: With small, tight knots throughout, Knotty Pine is a hardwood with a natural, rustic look that is at home in any home. The straight grain and fine, even texture makes it an attractive choice for a butcher block countertop, and the light tone of the wood brightens any space. 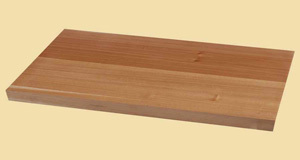 Knotty Pine has a light brown heartwood, with a touch of auburn, and a very pale, yellowish sapwood. Available up to 4-1/2" thick, 15 feet long, and 84" wide. Mahogany Butcher Block: A classic, traditional hardwood goes from old school to modern new style when applied to a butcher block countertop. Mahogany is a deep, richly toned wood with medium to dark reddish-brown heartwood and a slightly lighter sapwood, and it grows darker and more vibrant with time. Offers excellent durability and workability. Available up to 4-1/2" thick, 142" long, and 84" wide. Maple Butcher Block: Maple is a strong, wear-resistant hardwood that makes an outstanding material for butcher block countertops. The warm, white-to-light-brown heartwood over a creamy white sapwood gives Maple a gorgeous "winter white" tone that brings a clean, pristine air to your kitchen. Its fine texture maintains this impeccable look even close up. Available up to 4-1/2" thick, 15 feet long, and 84" wide. Poplar Butcher Block: A superbly stable hardwood, Poplar hardwood has a uniquely earthy coloring. The heartwood of Poplar ranges from a light brown to a greenish beige, and the sapwood is a pale cream color, making this wood a pleasing choice for butcher block countertop in a room featuring earth tones. Available up to 4-1/2" thick, 15 feet long, and 84" wide. Red Oak Butcher Block: Red Oak has a distinctive grain, with a wealth of contrast and color variations. The light reddish-tan heartwood and nearly white sapwood add to the interest of this tough, heavy hardwood. As a butcher block countertop, Red Oak would be the centerpiece of your kitchen, a gorgeous, singular surface that is both practical and decorative. Available up to 4-1/2" thick , 15 feet long, and 84" wide. 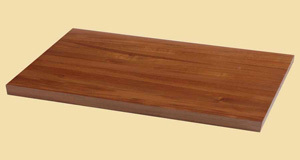 Spanish Cedar Butcher Block: Known for its distinctive aroma, Spanish Cedar is a highly stable, strong hardwood. Its heartwood starts out as a pale reddish brown when first cut, but darkens to a medium to dark reddish brown with time and exposure. The subtle sapwood blends well with the wood and, along with the fine to medium texture of Spanish Cedar, results in a smooth, even wood. An understated, polished choice for a butcher block countertop. Available up to 4-1/2" thick, 15 feet long, and 84" wide. Walnut Butcher Block: A truly uncommon wood, Walnut offers rich, chocolate brown tones hard to find in any other hardwood. The heartwood ranges from a deep, dark brown to nearly black, and the sapwood is an off-white to tan color. Walnut makes an exceptional surface for a butcher block countertop. Available up to 4-1/2" thick, 165" long, and 84" wide. White Oak Butcher Block: White Oak is a strong, durable hardwood that translates to a premium butcher block countertop. 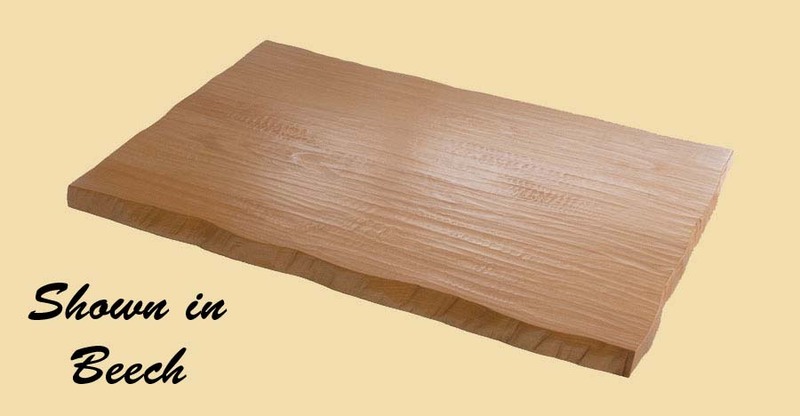 White Oak's heartwood varies from a light to dark brown, and the sapwood is a light tan. 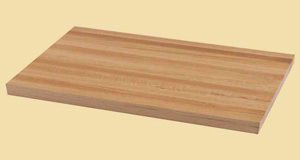 Its characteristic grain sets it apart as a choice for a butcher block countertop. Available up to 4-1/2" thick, 15 feet long, and 84" wide. Sappy Walnut Butcher Block: Filled with brown heartwood and lighter colored sapwood, Sappy Walnut provides wondeful contrast that will be noticed in any surrounding. Available up to 4-1/2" thick, 142" long, and 84" wide. 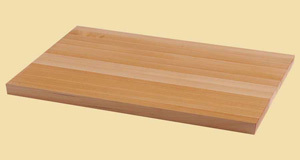 Character Maple Butcher Block: With the durbality of Maple, Character Maple has a more varied appearance. Containing knots, darker boards along with the some of the same tones as maple, a rustic look is achieved. 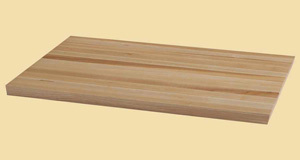 Available up to 4-1/2" thick, 15 feet long, and 84" wide.